(NY Daily) -- Barneys has agreed to pay $525,000 to settle allegations that the upscale retailer deliberately targeted minorities entering its Madison Ave. flagship store. The review began this past October in response to a series of Daily News articles exposing numerous complaints about racial profiling at Barneys and Macy’s. Schneiderman’s review of Macy’s continues, but Barneys executives last week agreed to the settlement. As part of the deal, Barneys agreed to pay the $525,000 in fines and legal expenses, to hire an “anti-profiling consultant” for two years, to update its detention policy and to improve training of security and sales personnel. The problems apparently started in March 2013 when Barneys hired a new security executive, the review found. In the ensuing months, door guards “exclusively identified minority customers as warranting surveillance,” complainants told the attorney general. In-store detectives regularly followed minority customers even after sales associates identified them as frequent patrons of the store, complainants alleged. 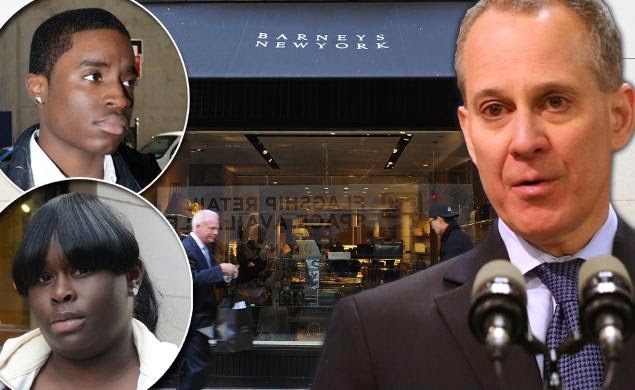 Former Barneys employees told Schneiderman the store detectives were regularly pressured to “be more proactive in making stops and getting more ‘cases,’ ” the settlement states.